This morning the wild turkeys came out of the woods and on to the back lawn for a visit. The last time was in the Fall when they were in the front yard with a small herd of deer, so it’s been a while. While I am very much looking forward to our move, there are some things about the place I’ll miss. 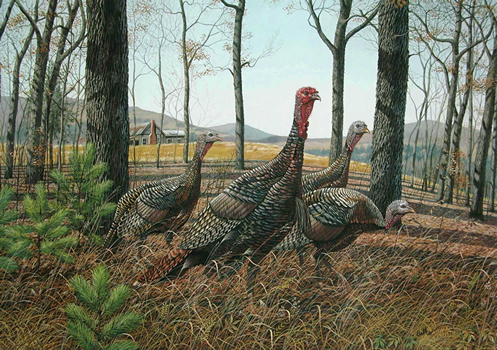 The wild turkeys are high on that list. But moving we are and the ongoing prep made for a busy weekend around here. Triumph Scrambler just like mine, although mine is a bit more beaten up. Sunday I put the battery back in the Triumph and got it fired up for the first time since putting it to bed last November. It started beautifully which pleased me as I had been concerned. By the end of the season it was exhibiting some rough running issues while warming up. Likely carburetion. Then, when I drained the float bowls for storage, the one on the left kept spewing gasoline. So I had to close it up and leave it stored with the fuel in place. Never an ideal situation, even using fuel stabilizer. My pal Tom has offered to help me sort out and repair whatever issues these turn out to be. That will address point #6a of my plan for 2013: Learn some motorcycle mechanics. I’m particularly glad this is coming together as point #6 – The off-road motorcycle training course – had to be cancelled (or at least postponed) due to time considerations. It had been scheduled for this past weekend, but with everything surrounding the house sale and move the plug had to be pulled. Maybe in the Fall. Tom is well suited to the task even though he has in his words “never laid a wrench on a Triumph.” A collector and racer of antique bikes, he has laid a wrench on plenty of others. The Triumph might not be old, but it still mostly uses the simpler technology of those bygone days. Not Tom’s ’48, but close. I met Tom while out walking the dog one beautiful summer’s day when he came puttering down my street on his drop-dead gorgeous 1948 Harley panhead. Understand, please, in this context “drop-dead gorgeous” means completely original and un-restored condition. 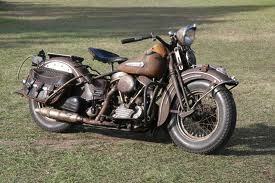 If you know old motorcycles you now have the right mental image. If not, picture a machine with about 75% rust and 25% faded paint. See? Drop-dead gorgeous. 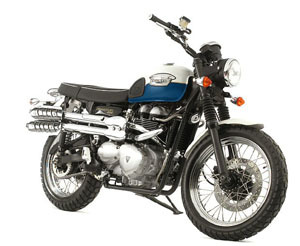 Since Tom is gearing up for the racing season we won’t be able to touch my Triumph until May; timing that, with my move and all, works perfectly for me. In the meantime, he has graciously agreed to let me keep it over at his place. So we spent a couple of hours moving his equipment around to make room. Basically, Tom’s place has four garages. The 2-car attached to the house is for the cars. Across the drive and to the back are two joined single car garages that are his motorcycle workshop and storage. Down by the road is another where we, perhaps optimistically, put up his tractor and snow blower for the season. In one of his motorcycle garages, Tom has built a sturdy wooden platform running along one side about 5′ high and 3′ wide. Bikes are stored under it and up top. One of those up top was his 1960s vintage Honda CB 160 racer, and job one was getting it down. Since the motorcycle lift only goes up about 3.5′ or so, this meant lifting the bike the extra 18″ from the platform down on to it. While balancing ourselves on the lift itself. One wrong slip and you’d have a YouTube worthy scene of us and 300 lbs of racing motorcycle crashing to the concrete floor. Easy job for two, not possible for one. 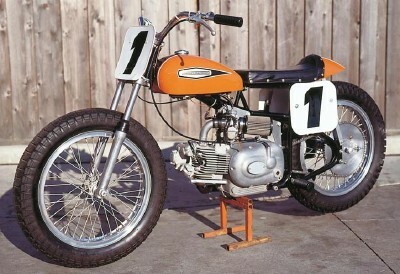 1960s vintage Aermacchi racer. Again, not Tom’s but close. Next was reversing the process to place his Aermacchi Sprint racer back up on the shelf. Back in the 1960s, Harley Davidson began importing these single cylinder bikes in response to the highly successful smaller Japanese motorcycles that were suddenly everywhere. It didn’t take long before they were being modified and raced. They still are today. Once this “heavy lifting” was done, it was just a matter of rolling the other bikes around and sliding my Triumph into place. That, and yakking about motorcycles of course. Other than riding, it’s hard to imagine a better way to spend a couple of Sunday hours. Now with the motorbike safely tucked away until post-move, I find myself realizing that, in addition to the turkeys, I’ll miss having a garage. The apartment parking is off-street but outside. That’s fine for my 2007 Subaru Forester. It is the right vintage to not have to worry about such things. And the lack of indoor parking will go a long way towards deterring me from the expensive mistake of buying a new car and running afoul of my pal Mr. MM’s buy used mandate. But the idea of the bike sitting alone and exposed bothers me. It might be, in my mind, the single biggest flaw in this whole apartment plan. There are some nice covers available that do a fine job of keeping out the elements. I’ll pick up one of those and hope it also has enough magic in the fabric to discourage would-be mischief makers. I’d hate to have to shoot one. Saturday was also a day of moving heavy objects about. Mrs. jlcollinsnh asked one of her colleagues to come by with his pick ’em up truck to help haul our dining room set and some other furniture odds and ends over to the consignment shop. Kurt is a fourth grade teacher at the same elementary school where she is a librarian and if the idea of a male fourth grade teacher puts a certain mental image in your head, keep in mind he is also the head football coach at the local high school. Unlike the football coaches I remember back in the day, Kurt works out with his players. He is about my size, which is to say football player big. He’s lean and very strong. Again, like me. Well, like me some 25 years and 60 pounds ago. A great guy to help haul heavy stuff around and, as it happens, a great guy all around. So in addition to getting the job done, it looks like maybe I’ve found a new friend. The invitation is out: Once we get settled in he and his wife are due over for my wife’s famous Indian Lamb Curry. I’ll be in charge of opening the wine. For sale now at a consignment store near you. Well, near us anyway. Why we took the dining set over to the consignment shop is a bit of an unfortunate tale. Originally the plan was to sell it on Craig’s list as I described at the end of my recent consignment shop post. I had figured that it was worth about same $500 we paid a colleague of mine for it several years ago. But then we had our heads turned and greed infected our hearts. Could it be? $1500? $1800? Might we triple our money on this thing? But wait. There is no brand name on it. Still, one of the movers looking it over in giving us an estimate did comment on how well made it is. That’s worth something, right? Certainly $500 is too low! But $1800? $1500? Nah, can’t be. I know, I’ll put it on Craig’s for $1200. That seems where it fits given the other ads currently up. Craig’s list: Dining set, $1200. No takers. OK. Stuff has to be low on Craig’s. But the consignment store, with their nice displays and customer flow, should easily get $1200. Let’s see, after they take their 35% I’ll net $780. So if I can sell it on Craig’s for $780 I can save the hassle of carting it over there. 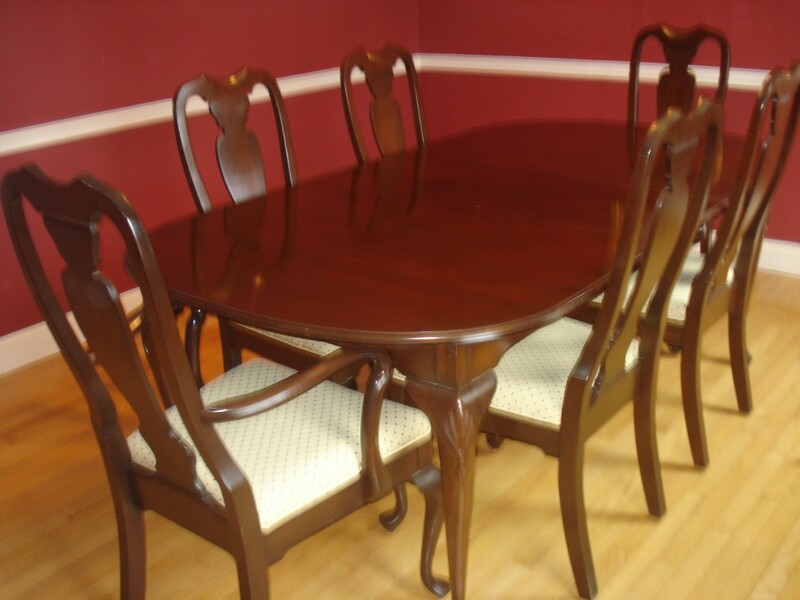 Craig’s list: Dining set, $780. No takers. Mmmm, I can’t get $780 on Craig’s and time is running out. But surely the shop can get $1000, right? For an $1800 (Oh, how the mind works!) set? That’s $650 in my pocket. $150 more than I originally thought and paid. I can live happily with that. Over to the shop it goes. Now, the important thing to remember here is that the consignment shop doesn’t tell you how they’ll price your stuff until they see it. They won’t even tell you if they’ll take it. You bring it. You unload it. They inspect it. And finally, if they take it, you cart it inside and set it up where they tell you. Like I said in that earlier post, a great business model. No cost inventory delivered free right to their door. Of course, they take it. It is a beautiful set. Then comes the price. It’s not $1800. It’s not $1500. Or $1200 or $1000 or $780. On the plus side, they know how to price things to sell. Any emotional attachments buyers rightly don’t care about are stripped away. Prices are realistically market driven. In this case: $600. Let’s see. Less 35% = $390. Some biblical scholars insist that Moses rode an old British motorcycle, as evidenced by a Bible passage declaring that “the roar of Moses’ Triumph is heard in the hills”. Joshua drove a Triumph sports car with a hole in its muffler: “Joshua’s Triumph was heard throughout the land”. And, following Jesus’ lead, the Apostles car pooled in a Honda… “The Apostles were in one Accord”. Hjeh hjeh hjeh. I’ve seen those jokes before and they always make me chuckle. That’s what I call “adapting religion to modern times”. I don’t see the new Pope jumping to it though. Ahh, motorcycles. I’ve done my fair share of cleaning out carb floats gummed up by cheap ethanolized fuel. I am pretty determined that my next batch of bikes will be fuel injected. I do miss bikes. Prior to my last move (early 2012) I sold off my motorcycles. That was hard to do. It’s so much fun AND got me 50 mpg for my commute. My retirement will *definitely* have me back in the saddle and riding cross country more. The most fun I had was on crotch rockets between Denver and Los Angeles. Mmm.. Working on them is less fun, unless it’s regular maintenance. I enjoy that. New plugs, a valve adjust (some HOnda’s have hydraulic valves, no adjustment, even better!) or tires, chain, cleaning, snug up bolts, charge a battery, clean some light bulbs and then take the Kawi KLR 650 out in the Rocky Mountains on some trails. Well I figure it’s about time I give working on them a shot. If nothing else I know I’ll enjoy the camaraderie. But my guess is, riding them will always be more fun. I can totally see jlcollinsnh getting all into the Zen and motorcycle maintenance thing. It fits. except for missing the patience and mechanical skills, I’m there! Dining table story shows again how dependent economy is on people paying crazy prices for items we truly do not need that badly. This past weekend we were shopping for swimming trunks for a 3 year old, and local US mall had some priced at $120! For a pair of swimming trunks that will be used for only one season! It probably costs less than $1 to make them in Bangladesh, but designer logo and fancy store add giant markup. As for the motorcycle, look for local secure storage facility. For $40 per month you can get a dry storage shed with 24 hour access and security. Ask your new neighbours for advice – in my case we discovered utility room in our condo that fits our bikes (non-motorized type). People don’t much care about formal dining room sets, silverware and fine china these days. The era of elegant living seems to have past. The remnants are priced accordingly. It occurs to me that, if you wanted to recreate that elegant lifestyle, you could do it for pennies on the dollar! The mill building right next to ours is a storage facility. But you can’t use it for routine in/out parking. I’m still looking, but to make it useful it would have to be walking distance from where we live. I can imagine your excitement and joy of not owning things… and thus marching towards true freedom.. aah, life’s worth exponentially more without physical and mental clutter. Let consignment shop deal with hassle to get rid of possessions. I am so glad that you are moving along so well to the path of lasting happiness pal! One of the things that occurs to me is how much easier the next move will be! As for maintenance I’ve found it’s really good to start simple. I’ve been doing all my own road bike maintenance and even after seven months I’m still getting the hang of it. Who knew it could be so difficult to replace a brake cable? Of course, a bicycle is a much simpler beast than a motorcycle but I suppose the same principles. You’ll have to correct me if I’m wrong. back in the day when I was riding bicycles and touring on them, I got to be a pretty good bike mechanic. One winter I even completely stripped, repainted and rebuilt my bike in my apartment. The paint job turned out wretched, but mechanically it worked perfectly. and I still have memories of repeatedly patching the same tube on a Welsh mountain side in the rain. They do, and that makes buying on CL tough. You could pick up a bike like an old Honda CB 250. They are dirt cheap and if it doesn’t work, even better. That way you don’t care if it never works, you just resell it. If you DO get it working, you get the immense satisfaction of riding around on it a bit, then selling it for a profit. It’s only one carb to clean, so you’ll easily get the hang of it. There are no fairings, so no expensive plastics to replace. The first one builds your skills and confidence a tremendous amount. Every time I’ve done a timing belt on the car, or brakes, or plugs, steering rack, whatever… I come out of it spending FAR less than a shop (Volvo wanted $250 for replacing the steering rack, and $1200 for the rack – I got the rack for $170 and paid $90 for an alignment when I was done! ), gained knowledge and probably ended up with an extra tool or two. All that, and saved a bundle of money. I’ve actually thought about doing just that and I even like the small old Hondas. It’s always nice to have a friend with a pickup truck! Consignment shops kind of scare me, but if there’s no movement on craigslist, they probably do know what they’re doing. I hope the rest of moving goes well for you! We’ve had some great Craigslist experiences that essentially gave us free high end furniture use for a few years. We bought a name brand leather sofa on CL for $500, used it for a few years, then sold it for $500. Same with our bed set, dining set, and an Ikea shelving unit. Great point, Jeremy, and our dining set could have been a perfect example had I been smarter. We paid a friend $500 for it around 2003 or ’04. Just got word the consignment shop sold it for $600, netting us $390. Not bad but I’m sure if greed hadn’t turned my head and had I listed it on CL, I’d have easily gotten the full $500.